Shopping channel QVC has introduced a new live TV streaming element to its mobile application, which allows users to quickly and easily see what’s happening on the channel while they’re on-the-move and then buy any of the products they like the look of all from within the app itself. You simply turn on the application and pick the “QVC TV” page along the bottom menu bar and within seconds you’ll be able to watch the QVC channel live. We imagine the quality may suffer a little if you’re only using a 3G connection, but we’ve been trying out the app this morning via Wi-Fi and the channel starts streaming within seconds and the quality is crystal clear. You can watch the TV live by holding your phone vertically, enabling you to still see the product information at the bottom, or you can turn your phone horizontally and the TV will take up the whole screen, allowing you to see the products in more detail. As well as being able to stream live TV, the app allows you to find out more about the item that’s currently on air, browse through recent on air items and search the whole QVC collection too. For bargain hunters, there’s also a special value offer on the “Home” page of the app and a Special Offers section within the “Featured” page too. 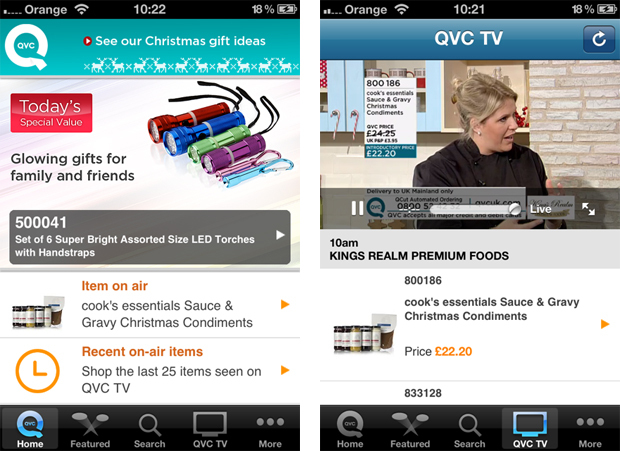 QVC shopping certainly isn’t everyone’s cup of tea, but if you’re a bit of a TV addict or you prefer to see products in action on the channel before you buy them, then it’ll be a useful addition to your app collection for frantic Christmas shopping over the next few weeks.